This is the first of two in a series of sermons with the goal of clearing the clutter that we tend to pile around the Bible. Join with us as we explore these stories together. Did Jesus ever tell a jo ke? Some people act like He was only the man of sorrows and that sour, and harsh actions are Christian service. Jesus was constantly at dinner with people and speaking to diverse groups. He was fully human and fully God, yet capable of weeping. It is reasonable to think that he would also laugh. Some believe that this comment about rich people was a joke! Granted, the punch line is lost to the centuries BUT that does fit. Scripture is dealing with life and death seriousness in our story today but Jesus is not afraid to laugh the truth into this crowd. Still this is not a comedy but a love story. Click Here for Mark 10:17-31 The text will tell you where I am coming from . This is a picture of 19th century graves of a Catholic woman and her Protestant husband, who were not allowed to be buried together. On the Protestant part of this cemetery Colonel van Gorcum, of the Dutch Cavalry. His wife, lady van Aefferden is buried in the Catholic part. They were married in 1842,the lady was 22 and the colonel 33, he was a protestant and didn’t belong to the nobility. This caused quite a commotion in the day. After being married for 38 years the colonel died in 1880 and was buried on the protestant part of the cemetery against the wall. His wife died in 1888 and had decided not to be buried in the family tomb but on the other side of the wall. Two clasped hands connect the graves across the wall telling a love story that is bigger than the grave. The barriers weren’t brick-class, denomination/style, family relationships, background, or gender-they were spiritual. Even in death they found a way. Their love story reflects the love story that the Gospel has for us. Jesus is in the region of Judea and across the Jordan. He is teaching at a furious pace to prepare his followers for the crucifixion. His inner circle of disciples is trying to “get it” and temple staff members are there to make sure they don’t. A man rushes up and asks the central question of all life, “what must I do to inherit eternal life?” Jesus starts listing the 10 commandments, but the man hastily interrupts-saying Come on, I know this. Jesus “Looked at him and loved him”. He saw his spiritual brick-wall and told him to give away all of his riches and follow. The man clung to his money and went away sad, unrepentant and unredeemed. 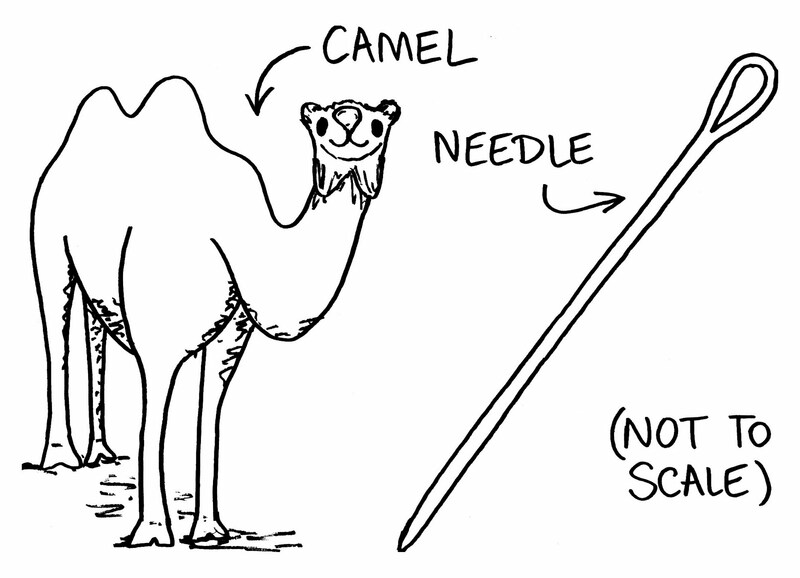 Jesus rounded up his disciples, laughed and quipped about running a camel through the eye of a needle being easier than that rich guy entering into God’s kingdom. Jesus laughed the truth into them that God gives us the gift of possibility where we have none without on our own strength. Good old clumsy Peter piped in that they indeed left everything to follow him. He was trying to live out of the rich man’s spiritual problems instead of his own. Thus pointing out that they were way ahead of that rich guy. Of course Christ’s closest ones there wasn’t whole lot of riches to leave behind.. I am sure that Jesus just shook His head. The point is not what they lost by following but what they gained, which was everything, Nothing we can lose by faith can compare to What Jesus Gives us. Indeed the more we leave behind by faith the higher the capacity to reap spiritual riches. “But many who are first will be last, and the last first. Come on… we know this! but it is hard to walk away from our walls. Our real separation is not brick, class or background but a Spiritual relationship with God that show us and then removes the false separations built in our own minds. Even in death Jesus found a way to overcome the wall that is sin/separation, and he did that through the Cross and our inheritance of an empty tomb. We have walls between us and God of our own making. God is assertively reaching over them to grasp our hands. Of course we have to live inside our own walls, not those of someone else. God reveals our separation, our sin, and the Grace of Jesus removes them one brick at a time. Keep reaching! Grace reaches back when we risk losing something personal to gain everything. The empty tomb is a better place to live than the grave yard. Salvation is a personal gift but is lived out in our church families. Congregations build walls too. When we hide behind the walls of style, denomination and tradition we slap God’s nail scarred hands away and retreat into our four lonely walls. Unity is as tough now as it was in Jesus’ earthly ministry. Like then, we are living in a world of change and are left to witness to an unchanging God in our ever changing cultural reality. How, by looking at to Jesus as our ground and goal rather than trying to cling to people. By gladly preparing our church for the next generation instead of trying to make them look like us. Focusing our vision is listening to God rather than just making better plan. At Cheatham Memorial we are unveiling our new vision statement at Charge Conference next week. This is more than a glib slogan but a way of discerning. We settled on “Welcome Home!” This is what I want to hear when my time on earth is done and what we want others to hear when they step through our doors. Rather than just doing good things, we will test our ministry and ask if we are following Christ, serving the community and unifying the body as we do them. If the answer is no then we are probably only serving ourselves and need to re-think. Live in Christ, you cant lose. Let us work according to Christ’s mission and we have already succeeded. and when we quit telling God, as the rich young man did, how smart we are and move toward disciplined listening we will grow in Grace and live a life of significance. This is a follow up to our sermon from Sunday and I pray it touches your heart. Please find a church that gives you a hearty “Welcome Home”. If you find yourself in our corner of East Texas, Come and see us! Before health education and restrictions on the tobacco industry nearly everyone smoked . People who did not smoke often carried light to share for others as a courtesy. As a kid, I was fixated on the Zippo Lighter. They clicked, flicked and snapped into a flame that did not consume the fibers in the center of the little chrome grid. This was cool and weird at the same time, just like the “burning bush” that confronted Moses. God had a mission and a direction for Moses. He had a cool-weird Zippo lighter moment and had the presence of mind to listen and follow. Our smoking habits have changed. 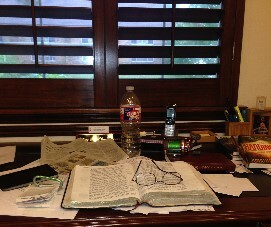 Lighters are not as commonplace BUT Jesus is still the way, the truth and the life. He is the God of all creation and that does not change with the whims of culture. God is the source of direction for our lives. Even when we lose our way, God is still speaking to his people. The greater question is, are we listening? Moses has lost his way. Born into hiding, prayed into being a prince of the most powerful nation in history. He had everything all figured out until he killed a man. God called through an angle in the guise of a fire. Like a zippo, the flame is alive with sound sight and the very voice of God but it is not consumed This is a holy moment on a holy patch of ground. The message: GO to Egypt, bring the message of victory and release, deliver them. Your marching orders, your credentials and your provision is simply from “I AM. Tell them I AM sent you. This is a derivation of the Yahweh, the name of God. They would understand. There is no question that this burning bush moment is God’s direction, authority, and provision. He may question his sanity or his faith but this is to far out there to be anything less than God. He shows more than a little doubt of self or his ability but the mission is all there. Wouldn’t you and I have a less anxious life if we followed God’s clear direction with such surefootedness. A young man that is now a certified lay minister and holding down a church asked me a question. We were have a parking lot conversation with another pastor who was accustomed to saying “God told me” this and that, whether choosing a song, sermon, or a car. He often spoke this way and I knew him as a man of God committed to the Gospel and prayer. The young lay pastor was quiet in this conversation as our neighbor was telling us what God had told him to do. After this pastor left, my friend quietly asked. “Brother Joe hears from God? How does he know its God and not someone else?” This is a great question . Moses has some hints for listening for God’s voice in this story. I have never heard Charlton Heston’s voice booming a message out of the rafters or had writing magically appear on the wall but I hear God’s voice in my spirit. Many of my friends and colleagues have been re- assured of their life’s direction in many different ways. How do we hear? How do we know it isn’t a misleading voice? Good questions! People are dying from a lack of direction. Suicide, depression, missed opportunities, lost wages to unproductivity burden us when we lose our direction and flounder in our faith. It can all be crushed by simply knowing and following God’s direction by faith. Before you get too excited though, God makes us work for it and we will battle with doubt most of the way! We are seldom blessed with an angelic and fiery message. We live by faith and not sight. God’s message is subtle, silent and sure we have to listen for it. Consider these when you are discerning your life-direction. Walking in faith and seeking God’s direction begins when we pay attention to God in your everyday life, create time and place for prayer, know your own story. The light of Christ is your, portable, powerful and shareable. Jesus isn’t I was or the I will be he is the ever present and eternal “I AM”. Jesus is your portable, powerful, eternal and living flame. Carry it well and share! This is third of four sermons on discerning God’s true direction for our lives, this week we look at MOTIVATION! God’s will for our lives is healthy, sensible, less anxious,and God want us to follow Him. Our First sermon focused on prayer, Everything begins and ends with prayer, The exercise was to pray “ceaselessly” a spirit of prayer and not an act of prayer. The second dealt with passion for this discernment- You have to want it. This week is motivation: What plugs you into the amazing power of God. Its as present as a power line but you must connect! wherever prayer driven passion is, there will your motivation be. Discernment requires us to know it, grow it, act upon it and use it to grow closer to God. My grandfather helped found an electrical Coop before WWII. This would revolutionize his rural area but at first had little impact. Why? There were few things to plug in and little understanding what this newfangled power did. One man hooked it up, plugged in a light bulb and enjoyed the ability to read at night. Everything was fine until he got his first bill-about a dollar, and he threw a fit. If the coop would not negotiate a deal he threatened to take out the bulb and let the power spill onto the floor! Not much understanding. What do we Know, You have to plug in, it costs, useful, destructive, scary, You need to understand it to be able to use it. Electrons get excited at the source, are generated onto the transmission lines, do their work and return to the source. Unplugging anything along the way that break the flow, stops the power. The power is still there but the “Short-Circuit” stops the work of power. So it is with the quest for God’s plan for our lives. You have to plug in and pay the price! 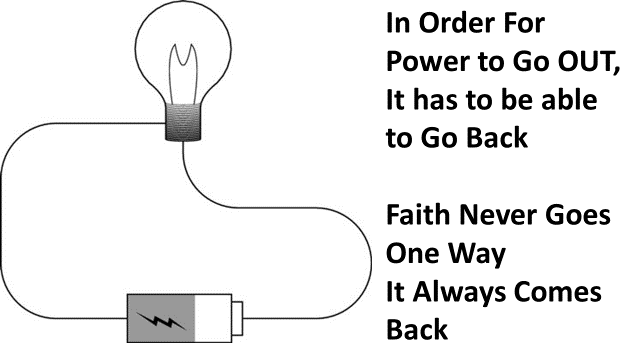 When you plug in you will want more and this is this source of growth-moving from faith to faith! FAITH MOTIVATES FAITH in a self feeding circle! Check out the text! Paul is Asking Two Questions: What Motivates you and Us, second, What Should Motivate you and us. . The second question is the best question. The text has three motivators for a follower of Jesus to discern God’s mission for our lives instead of a random decision or mere chance. First, the end zone, goal, ground, plan and reward with responsibility is FAITH. We move from faith to faith to live by faith. Second, faith in God is for us personally but lived out in community “Mutually Encouraged by each other’s faith”. We motivate and are motivated by our fellow travelers! Third and finally, The gift of “Sent-ness, or apostleship.” This isn’t geography but a state of the heart. We are sent where we live to be plugged in, excited, to give witness to the power given to us to work and return through praise to God who changes our lives and the lives of others. My motivators are these three things: I love Jesus Christ, why, this is the source of love I have for others. I Love his church, This is his chosen powerline to transmit the very salvation of the world. NOT THE SIGN OUT FRONT! But the Jesus within the Church. and finally, I Love You, A pastor’s love is a funny thing these motivate me, drive me out of bed and keep me going. 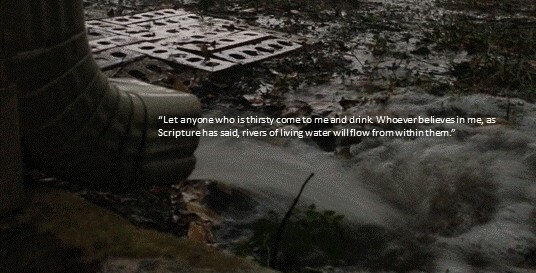 Few know the lengths I would go to to introduce you to Jesus, or a better way to deepen your walk with him. So now we ask the question, SO WHAT? 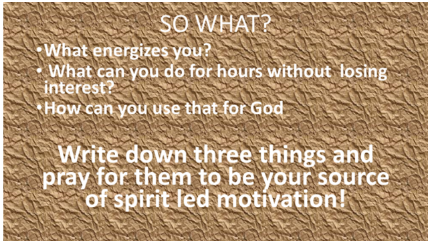 Ask these three and write down three things and pray for them to be your source of spirit led motivation! Give them to God and find a new energy for spiritual growth. Paul said, I am not ashamed of the Gospel! Me neither, how about you? These briefs are a follow up to our Sunday worship. I pray that you enjoy them but they are not a substitute for being in church. Attend your church or come see us at CMUMC. Do you have questions about how to become a Christian? contact me at revavanhooser@gmail.com or click on the icon below to contact our office. This second of five sermons that explores the discernment of God’s will/vision and then making it our mission to do. Following God’s plan makes for a less anxious and healthy life as well as connecting us to eternity. Passion is essential to knowing God’s Vision for our lives. We have to want it before we can know it or share it. I am a stick and earthworm sort of fisherman but found myself on the Walmart fishing aisle looking at plastic worms. Real fishing folks know that if they could talk a fish into the boat, there would be no fish out there to catch. There is always someone on the fishing aisle to talk to. On this day a gentleman fishing had this passion to teach me the ways of plastic baits and he had to get out or it might cause him physical harm. He told of big fish and many adventures along with my need for 7 1/2 inch watermelon colored worms with a circle hooks. This was the answer to life’s questions and the way to slay the most elusive fish. He told of these magic worms with such passion that I was ready to chew on one just to share the experience. In the back of my mind I thought that if I presented Christ with the passion that this fellow had for rubber worms, we would be short of parking spots and seats on Sunday. Passion is essential for mission. Too often Christians become Walmart talkers instead of Kingdom fishers. As Paul said ( 1 Corinthians 4:20) “For the Kingdom of God does not exist is talk but in power. Passion is a key ingredient to discernment. We are Christ’s love in Action and not Christ love in talking. Faith is learned by DOING! 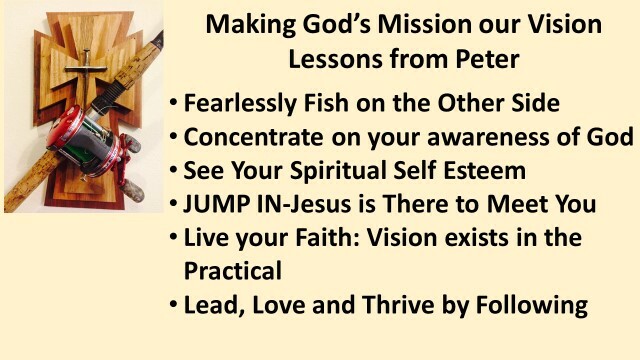 Peter was led by passion over the gunnels and into the lake. He wanted Jesus! The rest were left to row the boat-That takes passion too. This fishing advice became advice for life. They were fishing for survival and not recreation. Follow Me. Jesus didn’t send them to a conference or form a committee, he identified himself clearly and in him, defined the role of a disciple. SO WHAT? What do we do with all of this? Jesus is meeting us where we are, to tell us we can handle life , to do what needs to be done. Follow Him. Do the Life in Christ with Passion! Want it! Don’t complicate this Process. Talk to people God Brings your way. Fish-Practice the power of letting someone speak for 2 minutes or more uninterrupted. Inhale each time you are tempted to speak. Know-You are a beloved child of the living God-God put you in this conversation. Lead by following-Don’t lecture them, tell of how Christ works in your life everyday. You grow when your show your passion. This may be loud and rowdy, but more likely it will be quiet and conversational. 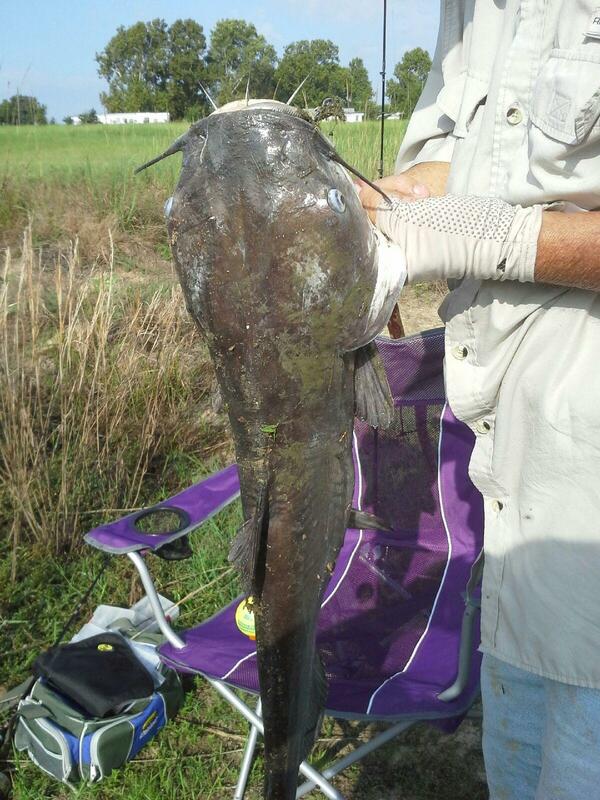 Write a comment of this encounter and I will mail you a 7 1/2″ watermelon colored fishing worm! Yes, Really. Follow Jesus with passion. Who knows, You might change the world. How do we pray for God’s will in our lives? Where do we start. Deep down we want that win. OUR win. Deep down we want to become closer to His Son Jesus for the experience and keep us on the high moral road as we do it. However, if some force were to viciously smite the opposition that’s ok, as long as we can claim it as God’s will and not any doing of our own hands. That is not discernment. What is the real deal? How can we discern what God wants without feeling like a loser. The reading today, from First Thessalonians chapter 5, Gives some clear direction for us in how to find God’s will to perform our mission! 1. God’s will is found by those who live urgently. The game is uncertain certain until the clock runs out. Faith is being uncertain and trusting God anyway. We must choose darkness or light, ignorance or wisdom, fear or certainty. Take action now. We are not a loose collection of individuals, we are a team, we all win or none of us win. Respect the co laborer, wake up the lazy, encourage the bashful and help the weak. This letter was written to the Church. We do not always agree what is truth. Rejoice always, Pray ceaselessly, be thankful in good and bad times, this is the fruit of faith and not the compromise of weak resignation. God’s will is not just getting what you want, and is seldom discernible by how we feel. EVERYTHING BEGINS AND ENDS WITH PRAYER. Discernment is way Bigger than just words and church attendance, it is hard work and many won’t do it, It is scary and many more will ignore it. Do it! Many of us walk in uncertainty. YOU DON”T HAVE TO! in these bullet points, taken from this letter are the starting points for aligning our vision and mission with God. This is our Proposed vision Statement a statement of who we are, whose we are and a standard of testing for God’s will in our ministries for our Congregation. This is how we will test our ministries as a group, a family at Cheatham Memorial UMC! 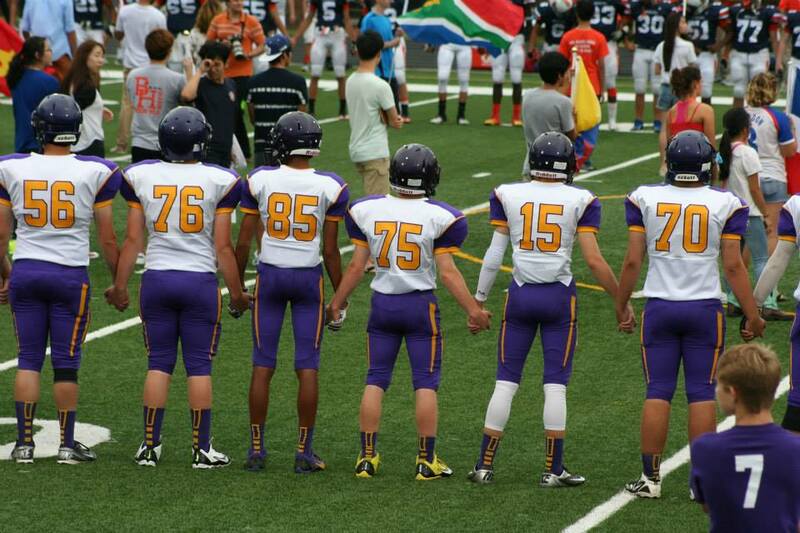 SO…….. How do you pray for a Bulldog Football Game? You ask boldly, by faith and in the name of Jesus Christ for God to win regardless of the score instead of telling God what to do! I am a competitor! But when God wins, we all win. This is the first of Five Sermons on discernment. See you next week. Thanks for reading this post. I pray it encourages your life and leads you to worship in the church of your choice. We would love to have you visit us at Cheatham Memorial UMC! There is a difference between Teaching and learning. It is not measured in Words. The entire messages of James 1 might be best taught in this one Charlie Brown cartoon? God’s lessons are EVERYWHERE and the means of wisdom, not just the words of wisdom. This is the fuel and motivation of our holy calling as Christian Disciples. The holy calling of our teachers is a witness of this calling being worked out in everyday living. Not all of those in this holy calling are as famous but are just as important? Yeah Right! If you are in education for the bucks or the easy hours you are crazy. I wish that teacher pay reflected the impact they have on every corner of our lives. Sadly, the holy calling of teaching does not pay in accordance to the talents and education levels of our teachers. The thousands of dollars and hours spent by teachers without anyone knowing about them speak of a passion that goes beyond just having a J-O-B. Being relevant, having impact, getting to watch the world change, one child at a time is the real motivator. Often the payback is in hugs. More often our heroic teachers send a student out into the world without knowing how it will work out. Still, you get to watch that student, “get it”, and know you fulfilled your calling and mission. James, the writer of the book, did it all wrong as an educator, he had no credentials but that of a servant, assumed the worst trials and immaturity of his students, was paranoid about temptation, exalts the poor, insults the rich, crowns those barely hanging in there and assumes that no one understands God. But the real lesson God has for us here is simple. Faith is something you do, something you work on, something you live in and not just something you know. He says simply, DO YOUR FAITH and you will have it. He drives it home! SO WHAT? That’s all fine but once we are saved , what does it matter. Our master teacher, Jesus Christ comes to each of us with a holy mission to share Him with passion and purpose. It is personal. Our salvation, “done” and not talked about influence others to the healthy, live giving, practical and eternal life in Christ. It is not just for us, it is to go through us to all of those bulldogs around us and beyond that need Christ’s love so desperately. Someone is counting on you and I to faith into practice. Thank you for reading. I hope this post inspires you but it is not substitute for attending church worship, whether here at Cheatham Memorial UMC or your own home church! Blessings to you on your journey in Christ.